Get out Grandma's pitcher. You can even polish it if you want to brighten it up. The combination of the silver and the candy cane roses make a charming arrangement. These flowers are available in winter. Looking at an arrangement is like looking at a painting. When you look at this arrangement, your eye moves from the roses up and then back around the sides and to the bottom with the seeded eucalyptus, because the seeded euc. drapes downward gracefully. The vertical proportions in this arrangement are 1/2 to 1/2. The flowers are as tall as the pitcher. The horizontal proportions follow the Greek rule of the "Golden Mean," a ratio of 1/3 to 2/3rds. The pitcher takes up 1/3 of the width of the flowers. Okay, now that you've got Grandma's pitcher, the flowers and the wire, let's get's begin . 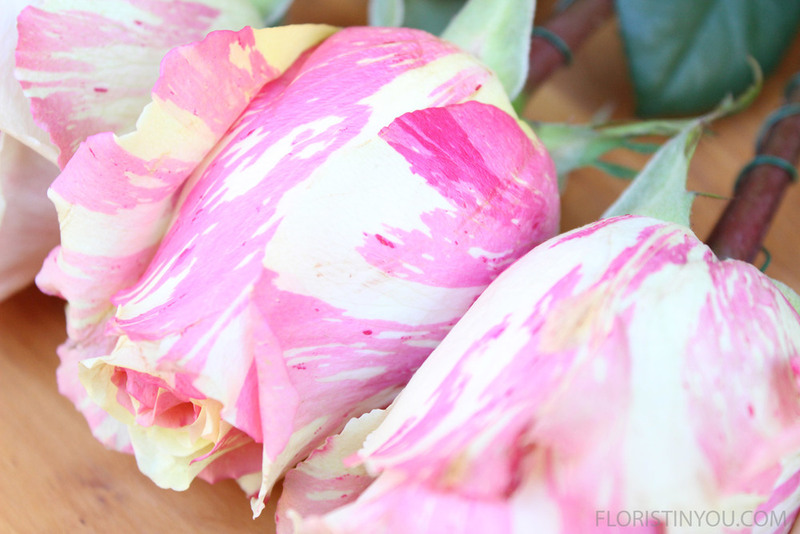 These are candy cane roses. Put in water until you use each. 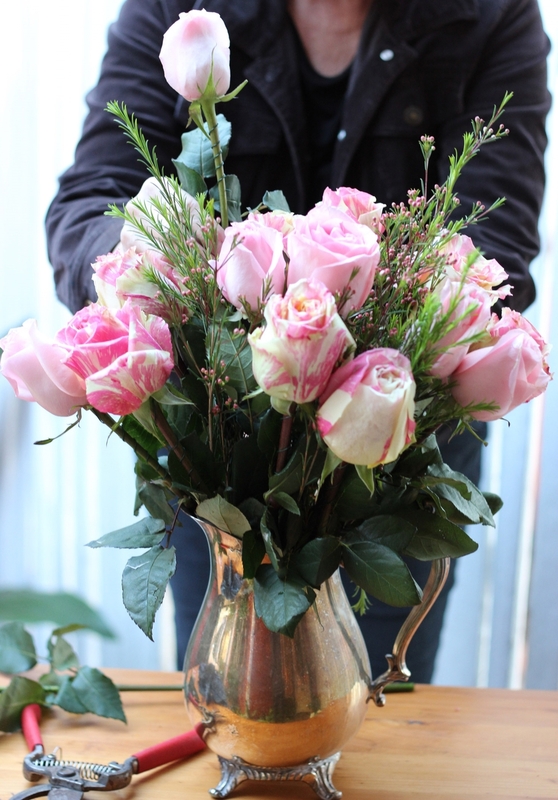 You will use 8 candy cane roses, 8 pink roses, 10 pink wax flower stems with buds, and seeded eucalyptus. Then get out Grandma's silver pitcher. You may polish it or leave its natural patina. Fill it with water until it's about 2.5 inches down from the top. 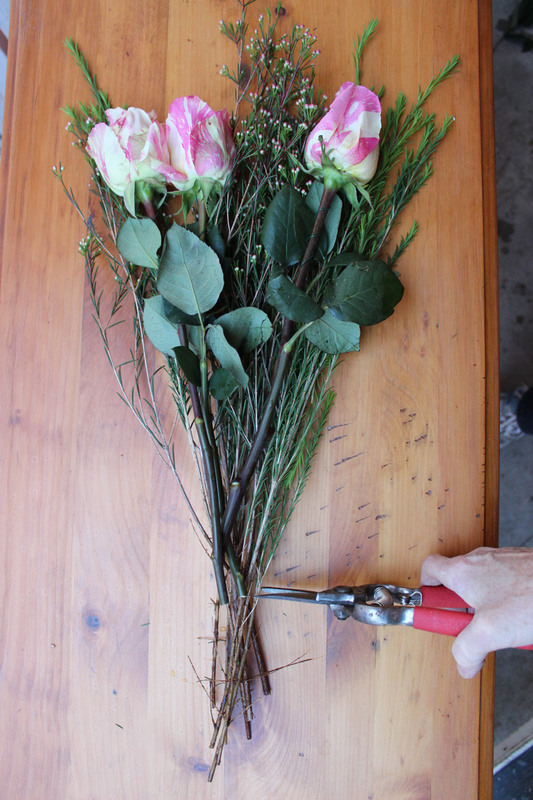 Snip a tiny bit off each stem and wire each rose. Use 1/3 a piece of floral wire. Insert vertically into calyx or "seed box". Don't pop head off. Hold with your thumb, and wrap it around and down stem. It will look like this. Don't wire all the way down the stem, because wires get tangled in the vase. 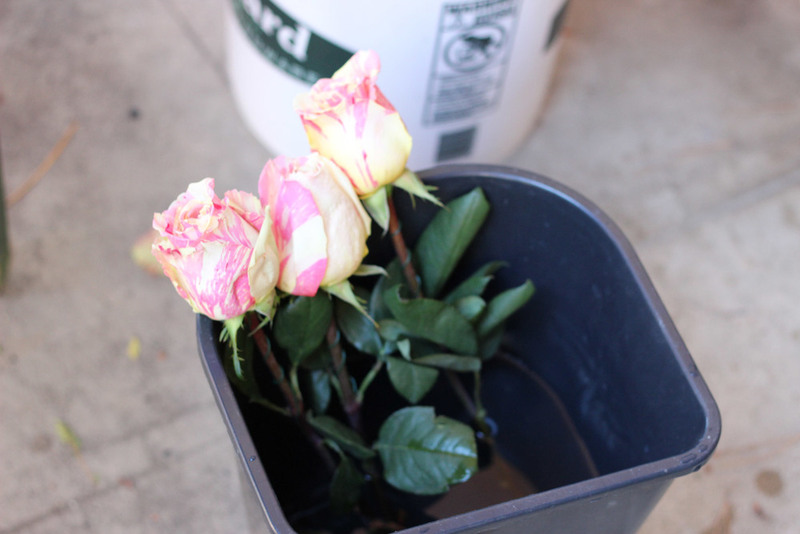 As you finish wiring, put each rose back into water. Make a grouping of 3 candy cane roses and some wax flower buds. Cut the wax flower bud stalks the same height as the roses. Place this grouping in the front of your vase. Add 3 candy cane roses to back, then one on each side. 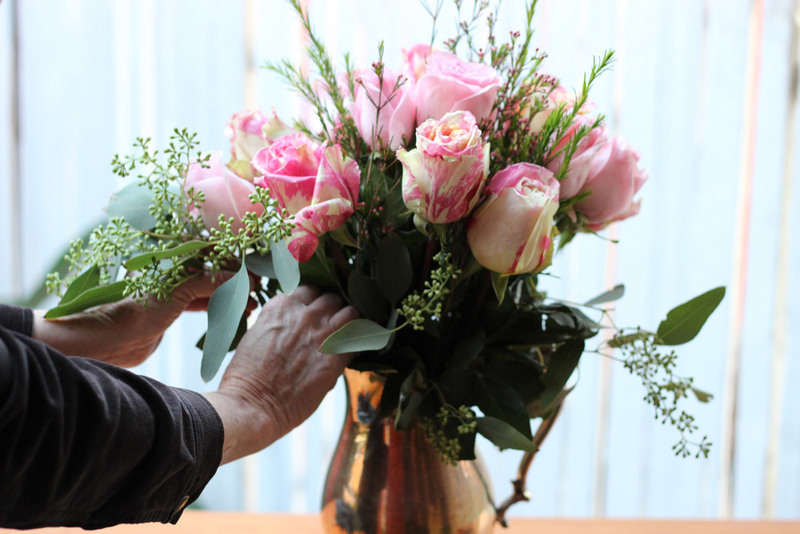 Next, add the all pink roses to create a full bouquet. Add 2 pieces seeded euc. on each side, 1 in front,1 in back. This is the finished arrangement. It is simple, but elegant.